The M/V ANGELN was a 132 meter container vessel equipped for the carriage of dangerous goods. On 21 February 2010, the vessel departed Vieux Fort, Saint Lucia bound for Barbados under questionable loading conditions. Shortly after departure, a problem with stability developed and the vessel took a considerable list. The weather conditions at the time of the accident were fair, the ship did not touch ground, and a collision did not take place. The order was given to abandon ship, which all 15 crew did successfully. The vessel capsized and sank approximately two miles beyond the sea buoy. The ship was lying on its starboard side in 32 meters of water with approximately 13 meters of clearance between the hull and high water. Several containers washed up on the Saint Lucia coastline. JMS acted as representative for the Saint Lucia Air & Sea Ports Authority (SLASPA) for the duration of the salvage operation. After reviewing the available data and cargo manifests, the JMS salvage engineer advised the Port Authority of the feasibility of various wreck removal options from refloating to cutting and lifting in place in order to prevent the wreck from becoming a hazard to navigation. JMS reviewed the salvors’ bid proposals for refloating the wreck and relocating it to deep water. The salvage plan called for parbuckling the vessel upside down, towing it to a deeper location, and sinking it there. The salvage operation began in early July. During the preparations for the refloating, a sheen on the water surface was observed. The source of the sheen was determined to be from leaks in one or more of the three containers filled with barrels of bitumen. A Pollution Abatement and Container Removal Plan was prepared to limit the amount of pollution from the leaking bitumen. It was determined that removing the three bitumen containers would be the best method for limiting pollution. The bitumen containers were removed prior to re-floating the vessel. Upon removal of the bitumen containers, the salvage operations were able to progress. The debris field around the wreck was cleared. Air lines were attached to all intact compartments for re-floating. The salvage operations were severely delayed due to the sea state conditions. The salvage and diving crew were dealing with 3 knot currents and 6-8 ft waves. The ANGELN was finally parbuckled upside down by pumping air into the intact compartments. 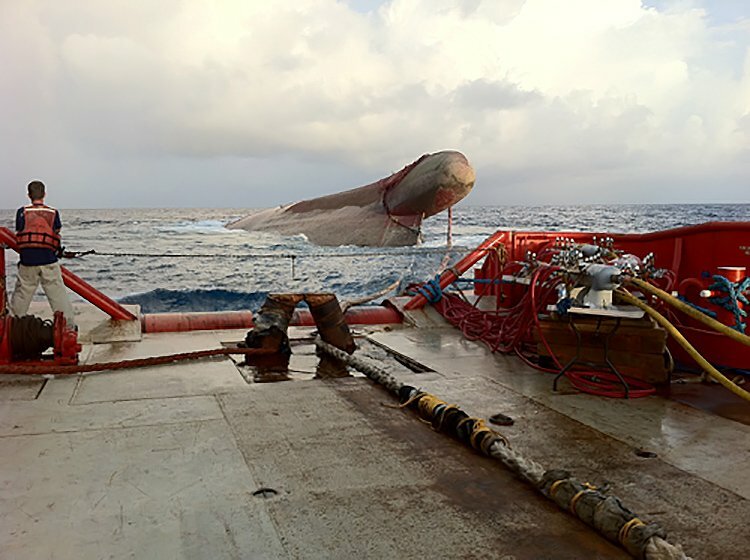 After 77 days on-site, the vessel was stabilized upside down and towed to deeper water and scuttled.